Book Cover: "One in five relationships starts on an online dating site, but little straightforward guidance exists for users. Enter digital dating whisperer Laurie Davis . . .
Love @ First Click is every online dater’s guide to exploring the web with no-fail techniques. For example, uploading the right photos can attract someone who might otherwise pass you over. Setting a time limit on the first meet-up can leave your date excited to see you again. And the phrasing in your date’s thank-you text after dinner can uncover how your click mate really feels about you. Whether you’re a digital dating vet or virgin, this is the ultimate guide to online dating that will take your online crush to offline love." Taryn's Review: I had just told a friend that I was done with online dating for the rest of the year when I saw this book on display at the library and I knew I had to read it. I've done my fair share of online dating, so I was curious as to what kind of advice Laurie Davis would have for newbies to the online dating world or for veterans like me. Given the publishing date of the book, I'm assuming that it was written in the years 2011-2012. Because of that, the book focused mainly on developing and using an online profile for sites like Match.com, OKCupid.com, and others of similar format. In 2015, most veteran online daters can tell you that those sites aren't the "hot" dating sites anymore; mobile apps have changed the dating scene and most people use Tinder or other app-based sites now. So even though the book was designed with the notion that one would be filling out an online profile, Davis offered good advice that can be carried through to the short profile spaces of online dating apps (and most of the dating sites have compatible apps so if you make an online profile, it will still be seen on their apps). She made really good points that I found helpful from the initial creation of a profile all the way to meeting in person with a match. This is a great book for people who might be new to the world of online dating and a lot of the tips can help people avoid pitfalls. The weakest point of the book for me is that I didn't find Davis to be the strongest of writers and at times a few of her tips felt contradictory to other given tips. There was a point in the book where Davis suggested wearing minimal makeup in pictures, and that annoyed me as someone who loves her makeup; I felt she was suggesting that "natural" looking women were preferable on online dating sites. But after getting better acquainted with Davis's writing style, I think what she was saying was that if you don't normally wear a lot of makeup in everyday life, don't post lots pictures with you wearing heavy makeup since that wouldn't give a real feel of who you are day-to-day. I really would love to hear Davis's perspective of using apps like Tinder since they are a different feel than Match, OKC, and the like. The navigation is different and the user profile setup is much different. Also, in her book Davis encouraged readers to not share personal information which she felt included first names. A lot of dating apps now automatically share your first name, so again, even in the short time frame that the book's been out, a lot of has changed in the online dating world. 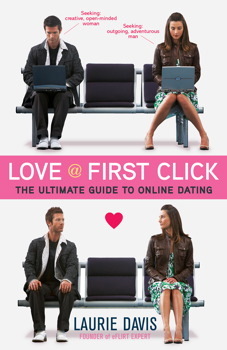 If you're brand new to online dating, give the book a go. If you're a veteran online dater, it's still a great book for some pointers on how to keep a fresh profile.